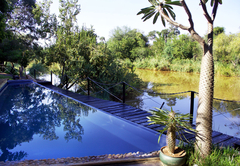 Mogalakwena River Lodge is a highly recommended Limpopo game lodge providing a wildlife experience for discerning tourists visiting Soutpansberg. 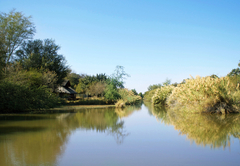 Mogalakwena (metaphor which means ‘fierce crocodile’) comprises the River Lodge, Craft Art Village, Artist’s Retreat and Research Centre. All units have air conditioning and tea / coffee making facilities. 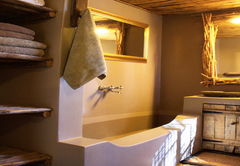 Luxury private chalet with en-suite bathroom, air conditioning unit, tea/coffee tray and a viewing deck facing the river. 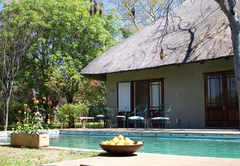 Deluxe main lodge room with en-suite bathroom opening onto the central lounge area with open fireplace and viewing deck. 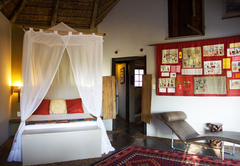 Main lodge room with twin beds and en-suite bathroom opening onto the main central lounge area of the lodge with open fireplace and viewing deck. 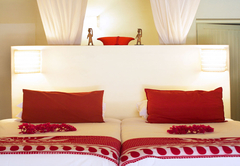 Our rates all include breakfast and dinner. and are served in the restaurant. 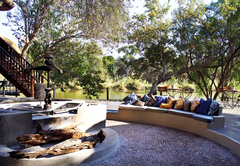 Activities offered on the reserve include game drives, wildlife walks, birding and fishing. 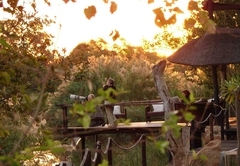 Guests enjoy the beauty and wealth of fauna and flora found on the Mogalakwena Reserves. 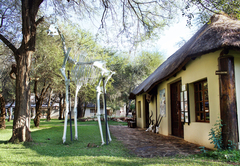 Mogalakwena Craft Art Village is the creative hub of the Mogalakwena Craft Art Development Foundation. 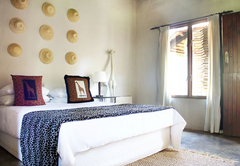 It was established in 1994 by Dr Elbe Coetsee and invests in the local community by developing local traditional skills, creating employment opportunities, preserving indigenous culture and traditional knowledge systems as well as creating high-quality hand made products. 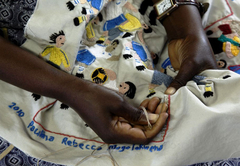 Mogalakwena Craft Art specialises in training of a wide range of skills including embroidery, beadwork, weaving, pottery and the basic principles of cultural tourism. 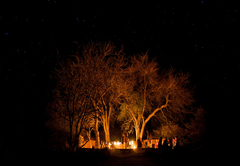 The Mogalakwena Research Centre is an independent research organisation with the aim to document, research and further understanding and knowledge in the fields of ecology and anthropology in South Africa. 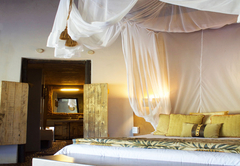 Mogalakwena offers the discerning guest an abundance of activities and experiences which are all focused on experiencing the soul of Africa. 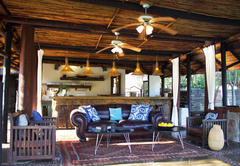 Accommodation, dinner, breakfast and a welcome drink on arrival. 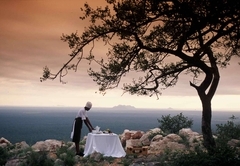 Lunch, bar, telephone facilities, activities, gratuities. 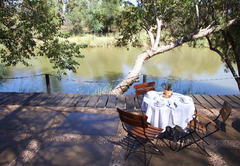 Response timeMogalakwena River Lodge typically responds to requests in 5-10 minutes. Child policyChildren are welcome but we advise that they should be under the supervision of an adult at all times.